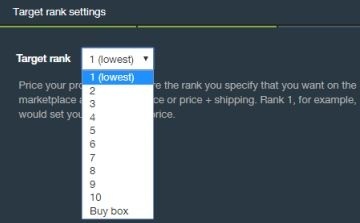 Attempts to price the item in such a way that it occupies a specific rank in the list of offerings by competing directly with the item already in that rank. You can also compete directly with the item currently in the Buy Box. When the Target Rank is focused on the Buy Box it will not move upwards in price once the Buy Box is achieved; if the Buy Box price goes upwards when we will move up to match that new Price. If you are not seeing the desired results when utilizing the Algorithmic Buy Box pricing strategy, this is a great secondary option that allows you to remain competitive based on your price ranking. This strategy is most commonly used to compete for the lowest price among competitors. You can even choose to match the lowest price rather than undercutting it.